(TORONTO, ON – January 17, 2013) Lexus Canada launches into the New Year with a remarkable new Lexus IS. The next generation of the popular luxury sport sedan, the 2014 Lexus IS series features an all-new, bolder design, dynamic handling and performance, a choice of engine sizes and rear-wheel or all-wheel-drive models, intuitive controls, advanced safety features and thoughtful, driver-focussed convenience and luxury. Choice of 2.5L or 3.5L V6 and RWD or AWD drive trains. GS-inspired steering and rear suspension for exceptional handling. Bold exterior design highlighted by distinct interpretation of Lexus signature Spindle Grille with unique LED front light treatment. New driver-focused, more ergonomic interior features lower driver position for improved comfort and driving experience. New 60/40 split folding rear seats for cargo-carrying versatility. F Sport models – Inspired by Lexus LFA Supercar and track tested at Nurburgring – feature available 8-speed auto transmission plus first Lexus to adopt G-AI control that actively match gear changes to G-forces generated during driving. F Sport models also feature special interior and exterior styling and performance enhancements, including unique seats designed to combine excellent comfort with outstanding lateral holding performance. Intuitive Human Machine Interfaces / user friendly screens / Lexus analogue clock / first Lexus to incorporate electrostatic switches. The 2014 Lexus IS series goes on sale at Lexus Dealers across Canada this Summer. For more information on features and specifications, visit www.lexus.ca. Lexus in Canada is the exclusive Canadian distributor of Lexus luxury cars and sport utility vehicles through a sales and service network of 36 dealers across Canada. With 13 Lexus models on the road today, five of them being hybrids, Lexus has the largest luxury hybrid lineup; allowing guests a choice in a large range of luxury vehicle segments. In the 2011 J.D. 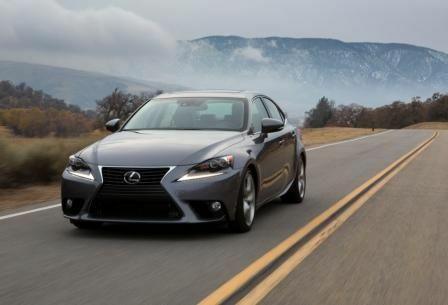 Power and Associates Initial Quality Study (IQS), Lexus won the most segment awards, four in total, of any nameplate.